Some days I go to the grocery store and plan out my meals well in advance. Other days I look at my freezer and pantry and wonder to myself ‘What the heck can I make with this stuff?’. Usually I am asking myself this about an hour before my family expects to eat something for dinner. Talk about pressure to perform, right? Tonight was one of my wing it kindof nights. I had thawed out some ground sausage from my local farmer but needed something to do with it. A quick Google search of ground sausage recipes found me a number of suggestions so I combined a few of those ideas and threw in some stuff I needed to use up in the fridge and voila! 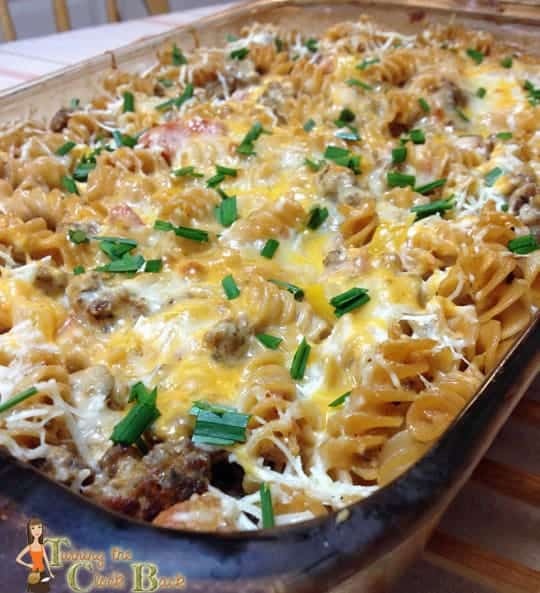 An easy Taco Casserole recipe. This taco casserole recipe uses taco seasoning…of course, that makes sense, right? If I had planned ahead a bit I would have made home made taco seasoning like my fellow bloggers at Acting Balanced and Green Eggs and Spam. As I mentioned earlier…tonight involved absolutely no planning so I grabbed a premade taco seasoning that I had in the spice rack. If you want this to be a bit spicier you can substitute Rotel for the canned tomatoes or add some diced jalapenos. 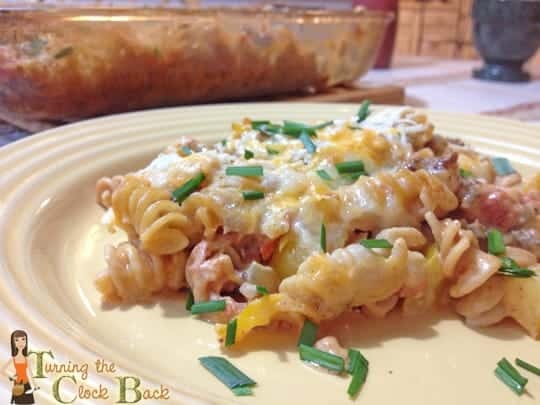 This taco casserole is an easy weeknight meal and it made plenty so the husband has leftovers for lunch tomorrow! In a large saute pan over medium heat cook ground sausage until almost completely cooked. Add in chopped bell pepper and diced onion. Saute for 4 to 5 minutes or until vegetables are almost tender. Add in the can of tomatoes (with juice), the water, the cream cheese, and the taco seasoning. Heat and stir until combined and the cream cheese is melted. Into a 13 by 9 inch pan combine cooked pasta and meat/vegetable mixture. Mix gently until thoroughly combined. Cook in 350 degree oven for 20 to 30 minutes or until bubbly. Ooh, this looks so yummy! oh it was! I am looking forward to leftovers for lunch! My kids love taco everything. I'll have to try this!